​Raise a Puppy, Change a Life! 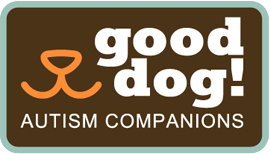 Enjoy this video about Good Dog! Luna and his puppy raiser, Brennan. 1. If you have puppy raising experience you can live anywhere in the US. 2. If you are new to puppy raising you MUST live in San Diego, CA • Eureka, CA • Fresno, CA • Las Vegas, NV • Petaluma, CA or Omaha, NE. Our puppy raising program provides a unique opportunity for you to assist Good Dog! in helping children and families living with autism. As a volunteer puppy raiser, you will provide a puppy with a safe home, take them to obedience classes, feed them a healthy diet, socialize them and give them lots of love. Provide a safe home environment. Supply Good Dog! approved food and other supplies required for puppy raising. Enroll and participate in Good Dog! approved obedience classes. Keep up to date notes in a Training Log. Participate in weekly online phone check-ins with our Lead Trainer. Expose the puppy to a variety of environmental and situational experiences. Agree to follow Good Dog! approved socialization guidelines and handling techniques. You must be willing and able to commit to the outlined responsibilities; you must have the ability to safely house and care for a puppy from eight weeks of age until approximately 14 months of age. You must be willing and able to devote time each day to oversee the complete care of the puppy: feeding, grooming, socialization, and exercise as recommended by our Good Dog! Lead Trainer. Good Dog! pays for all medical costs related to the puppy. Puppy Raiser pays the cost of supplies, food and care. Please note that your household must not include children under 6 or other pets under 2 years of age. You must have a fenced yard or be willing to create a secure area for the puppy to run freely.